Parents want their children to be generous. It pleases us when we see them give. And it pains us when they are selfish with their stuff. As they grow, they will encounter the same challenges we do as adults – generous living does not come naturally to us. As father to four children ages 8 to 18, below are some ways we strive to pass along biblical generosity in the Anderson home. As soon as our children are old enough to count their own money, we teach them to divide it into thirds: a third for saving, a third for spending and a third for giving. We are currently beginning this process with our five-year old, Autumn. Whenever our kids receive money – from chores, birthdays, gifts, etc. – they set aside a third and put it in their “giving” envelope. Separating into thirds is easy. And by giving a third of their money to God, they learn that giving is as important as saving and spending. As children, they have no taxes to pay or clothes to buy. There’s room in their budgets to give this way. After all, as parents, we provide their needs. By separating their money into thirds, we give them a bigger vision for their giving. But to them, it won’t seem like a “big” giving standard. It will simply be all they know. They are amazed how quickly their giving envelope will grow. You will be too. If one of my sons is saving for a $50 or $100 purchase, it’s not uncommon for them to have an equal amount in their giving envelope. 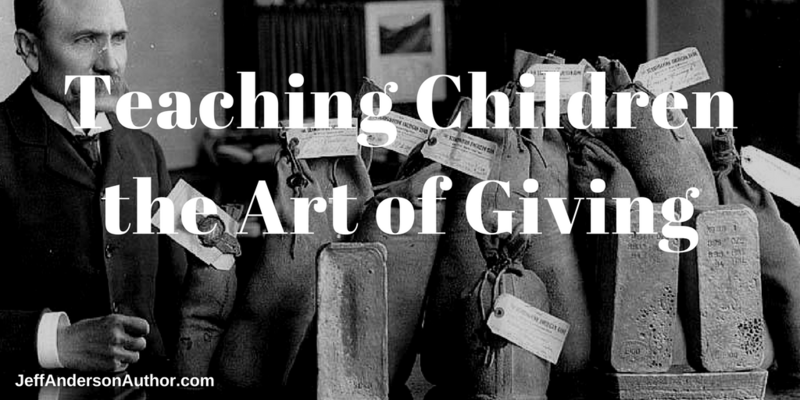 Even at a very young age, our children quickly learn the feeling of giving away an amount that really matters to them. We don’t teach our children that we must tithe 10% to the church. But we do stress the biblical command to “share financially where we are being fed spiritually.” Because the local church is our family’s most regular and familiar point of contact for worship and learning about God, a healthy share of our giving goes in that direction. For our children, I’m not sure if its 10% or not – my hunch is that it’s much more.